MANY CONSIDER THE 6000+ M PEAKS OF THE HIMALAYAS INACCESSIBLE AS THE CLIMB UP SEEMS LIFE-THREATENING AND PHYSICALLY IMPOSSIBLE. STOK KANGRI IS ONE PEAK TO BREAK SUCH STEREOTYPE AS IT IS A NON-TECHNICAL ROUTE LEADING ALL THE WAY UP TO AN ELEVATION OF 6,153 M (20,187 FT). 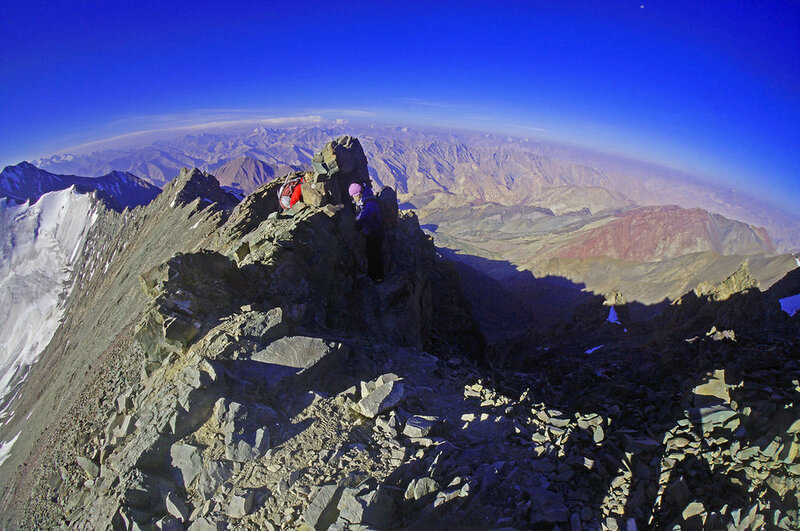 Stok Kangri rising up to 6,153 m (20,187 ft) is located in the Stok range of the Himalayas. It is popular among the beginner climbers. Despite its status as a non-technical climb, you should well prepare for some heavy lifting and the altitude as a steepening route may exhaust even those in their best physical shape. Visiting the cities and villages of Leh, Chilling, Skiu, etc. Acclimatisation while trekking the Markha Valley. Enjoing views of the Himalayas and even K2. A non-technical climb suitable for beginners. Opportunity to peek into the local life-style. Visiting local historical sites such as the Royal Palace and Tibetan Buddhist monasteries. Strong trekking and hill walking experience is recommended before taking up the challenge of Stok Kangri. On the other hand, as it has been mentioned, it is a non-technical climb, so no professional climbing experience is necessary. Keep in mind, that due to high altitudes proper acclimatization, mountain gear and clothing are necessary. Day 1: Leh – Acclimatisation. Day 2: Skiu – 3,450 m (11,319 ft), 4-5 hours. Drive to the village of Chilling from where you’ll be able to trek to the beginnings of the Markha Valley – the village of Skiu. Day 3: Thinlespa – 3,800 m (12,467 ft), 6 hours. In this section you’ll walk up through the Markha Valley to the camp in Thinlespa, located on the right bank of the river. Day 4: Hankar – 3,900 m (12,795 ft), 6-7 hours. You’ll be heading to the east and climbing steadily up the valley through the village of Markha, until you’ll reach the camp below the villages of Lower and Upper Hankar. Day 5: Nimaling – 4,720 m (15,485 ft), 8 hours. Climbing through narrow valley, villages until you reach the meadow of the Nimaling, by the side of the ice-clad Kang Yatse (6,400 m/20,997 ft). Day 7: Leh – Cross Kongmaru La (5,216 m (17,113 ft), descend to Chuskyurmo (4,155m/13,632ft), end trek at Shang (3,850m/12,631ft), 4 hours. Drive to Leh. Day 8: Matho Phu – 4,480 m (14,698 ft), 6-7 hours. Leave Leh early in the morning, drive across the Indus River to the village of Matho – the bridge at Choklamsar from where you trek along the stream up to Matho Phu. Day 9: Smankarm – 4,380 m (14,370 ft), 5 hours. Climb up to the Matho La (4,820 m/15,813 ft) and then descend into the valley to the north of Stok Village. Day 10: Stok Kangri Base Camp – 5,000 m. (16,404 ft) - 2 hours. Base camp is located next to a stream. Day 11: Climb Stok Kangri – 6,121 m (20,082 ft), return to Base Camp - 9-10 hours ascent, 4 hours descent. Day 12: Trek to Stok Village, 3,800m/12,467ft - 4-5 hours. Drive to Leh.